Create, manage and track task checklists for new hires with Empxtrack Onboarding module. Our module can also analyze onboarding metrics — such as hire date, status and overdue tasks. In addition, HR managers can provide real-time reports using our Onboarding module. Empxtrack’s Onboarding module contains several pre-configured forms such as Address Details, Beneficiary Information Form and Dependent Details Form. 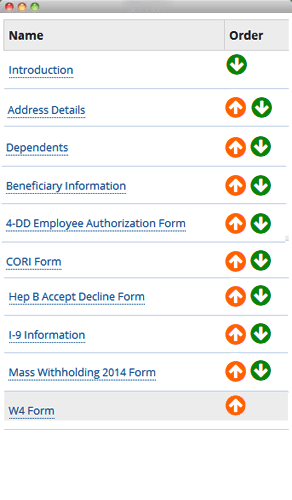 In addition, our Onboarding module allows new hires to fill out I-9, W-4 and state tax forms online. You can create forms on the fly that even support employee signatures. Empxtrack Onboarding module can make you ready before day one, so you can comfortably acquaint new hires with your company’s amazing work culture and make a perfect first impression. Our Onboarding module strives to enhance your onboarding process in specific ways and improve employee engagement and retention in your organization. Our automated Onboarding module is much easier to manage and can save vast amounts of your time and money.You may saves up to 16 hours per hire in employee orientation activities. Our Onboarding module keeps up with changing forms and requirements, so you don’t have to. If pre-configured forms do not fulfill your requirement, you may add/create new forms with Empxtrack Onboarding module’s built-in editing and data validation tools. Send and receive real-time notifications and alerts to keep new hires, hiring managers and HR admins on top of onboarding to-dos. HR manager can see/review all new and important onboarding activities and reports at-a-glance from a real-time employee onboarding dashboard.